Although there is no corn or gluten in this cornbread-like tiger nut bread, you won’t notice. It is so tasty, plus it is loaded with resistant starch from the tiger nut flour and buckwheat! If you haven’t yet heard of the importance of resistant starch, go here. If you have, then you are probably hoping to find some easy ways to incorporate resistant starch into your diet to feed your microbiome. Well here you go, my friend. First though, indulge me while I breakdown the other benefits of tiger nuts for you. Are not a nut but a tuber. Quick note: If you are experiencing a gluten sensitivity, are Celiac, or just like to rotate your grains seasonally like we try to do, you can rest easy because this recipe is gluten-free. If you make this bread with buckwheat flour instead of brown rice flour, it will also be grain-free. As stated above, there isn’t actually any corn in this recipe either. We call it tiger nut “corn” bread because the gritty texture of the tiger nut flour is reminiscent of the grittiness of corn bread. We like to top this bread with cultured honey butter! Preheat oven to 400 and put your cast iron skillet in to preheat. Add wet ingredients and mix. Take skillet out of oven and add a couple of tablespoons of butter and melt it. Pour batter into hot cast iron skillet. Bake for 15 minutes. 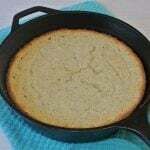 A corn bread like tasty treat full of resistant starch. Are you gluten-free or grain-free and looking forward to tasting something like corn bread again? What paleo friendly, nut-free flours can I use instead of buckwheat flour? Would cassava flour or arrowroot or coconut (or any combos of) replace it well? Cassava flour would work nicely! It will have a slightly lighter texture than with the buckwheat flour, but it should be delicious. Do You Have Harmful Spices in Your Cupboard?